Do you remember the article I wrote called Where to get free food on your birthday? I hope so because this article is about redeeming a $10 off coupon at Famous Dave's BBQ in Knoxville, TN. My daughter and I had errands to do and decided to use the coupon. It's been awhile since I've been to this restaurant. My family had a good time on our last visit so we decided to do it again. Famous Dave's is doing something different now. When the host seated us he told us the name of our server and told us to ask her why she is famous. So, when she came to take our drink orders we did just that. She made a couple of funny wisecracks that made us laugh. I'd post them here but it would require adding a spoiler alert. 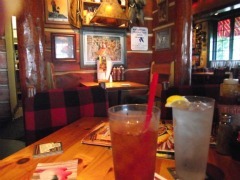 You'll have to go to Famous Dave's BBQ in West Knoxville to hear for yourself. She told us about the different sauces and brought a small bowl of chips to try with them. Famous Dave's BBQ has mustard, mild, spicy, sweet and everything in between. I think Famous Dave's has all the flavors covered. Trying them before the barbeque arrived was a good idea. In addition to being funny our server was on top of things. Amber kept the drink glasses filled and cleared empty plates away quickly. The restaurant was pretty busy but it didn't seem to get to her. She handled everything while her personality shined through. I ordered the pulled pork platter. The sides were corn and cooked apples. My daughter had the pork platter with corn and garlic mashed potatoes. Our meals also came with a corn muffin. Plan on getting a takeout box at Famous Dave's. You're going to need it. Everything was served hot and the service was good. We may go back to Famous Daves the next time we're in Knoxville. Our price after the $10 coupon was deducted was $14.50. Without the coupon the meal would have been in the $25 range. Not bad for two girls out for a night on the town. We really like the beef brisket. When trimmed correctly, it's melt-in-your-mouth tender. The only problem is the sodium content.